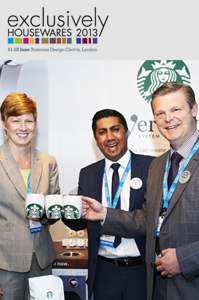 The top story in the July/August edition of progressive housewares magazine features a picture of EPE’s Noel Pamment & Harry Singh raising a cup with Starbucks’ Barbra Harmer at the Exclusively Housewares show. At this years show EPE showcased its new partnership as the exclusive distributors of the Verismo Coffee System by starbucks. The article also detailed the success of the Exclusively Housewares Show, which attracted its highest visitor numbers to date (up by just over 6% 2012) EPE are proud to be contributing to the success of the show and look to exhibit at the show in 2014.